Well, you know how we enjoy Show 'n" Tell when we get together? We get to ask questions and get the story behind the quilts directly from the ones who've created them. A bed turning is this same kind of sharing, only more! 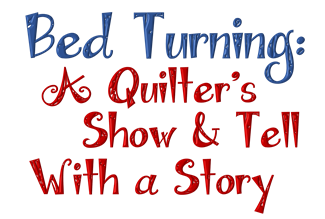 Suzanne Brown, a quilter from Danville who is one of our own here at The Quilter's Trunk, is willing to share a collection of her quilts with us, telling us the history of her twenty years of quilting through her pieces. Come for some education and inspiration. It's FREE! However, please register for the class so we know how many to prepare for! "Thirty years ago I took my first quilting class. We moved to Danville ten years later and I took up quilting in earnest. Joining a quilting guild and meeting other quilters soon lead to quilting becoming my passion. Through the last twenty years I have made some wonderful friends in this community. It is important to me to pass on the love of quilting for future generations. When you think about it, making a beautiful quilt is like living a good life. There are directions to follow, tools to guide us on the path and other tools to nudge us back when we wander. The end result for both are worth all the hard work." Come hear more of Suzanne's story. As we all know, our quilts are an artistic history of the interests and experiences of our lives. This bed turning will allow us a glimpse into the creative adventures of the quilter firsthand.